Begun in 1927 by Professor Thomas Parnell, this experiment was meant to reveal the surprising properties of an everyday material: pitch. Pitch is the name of a number of hard tar-like substances, and in this case bitumen was used. Though at room temperature pitch appears to be a solid and can be shattered by a hammer, it is, in fact, a very high-viscosity liquid, and Professor Parnell wanted to prove it. Brisbane's manmade urban beach has enough water to fill five Olympic-sized swimming pools. Just getting ready to perform the experiment took years. 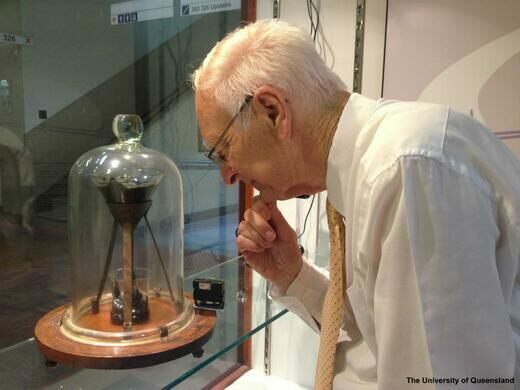 First the professor heated a sample of pitch and poured it into a sealed funnel…then he waited. For three years Parnell let the pitch settle in the funnel, until in 1930, when he felt the pitch was settled enough, he cut the bottom of the funnel, freeing the pitch to begin its mind-bogglingly slow downward escape. 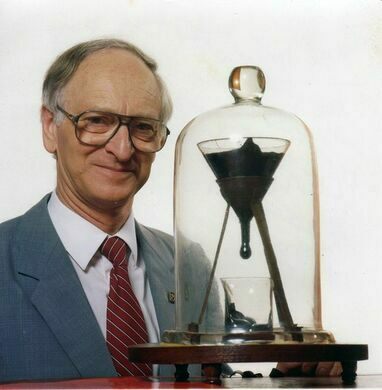 Professor Parnell lived long enough to record only two drips: the first in 1938, eight years after the opening of the funnel, and the second, nine years later in 1947. Parnell died in 1948, but the pitch experiment kept on going without him. As of 2014, the pitch has dripped only nine times. Ninety-one years after the experiment started, the tenth drop is only now forming. The pitch has now been calculated to be roughly 230 billion times more viscous than water. Curiously, because it only drips every 8 to 9 years, until 2014 no one had ever actually seen a drop fall. A webcam was set up in 2000, but due to technical problems it missed the eighth drip. 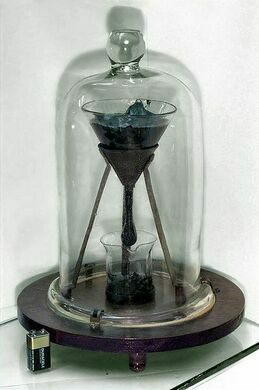 The ninth drip occurred on 24 April 2014 (during a beaker change), so the next pitch drop is estimated due in fourteen years. The webcam is currently set up, and one can try their luck - and patience - here. If the virtual experience isn’t enough, you can see it in person at the University of Queensland in Brisbane, Australia. Listed as the longest running lab experiment by Guinness World Records, the pitch experiment not only outlived its creator, but will likely outlive us all. It has been estimated that there is enough pitch to keep it dripping, ever so slowly, for another hundred years. This rickety old shed hides a trove of secondhand literary treasures. The last of Amsterdam's original sea level markers remaining in place.